The thin vertical lines appearing to the right of the picture's center are comprised of dust from Arp's loop, back lit by the far more distant galaxy. This portion of the loop becomes visually washed out as it passes in front of the bright spiral star system so all we can see are areas where the dust is dense enough to absorb the light and prevent it from passing through. Arp's loop is located near the outskirts of the Milky Way and positioned, strictly by chance, along our line of sight to M81 so it appears partially overlaid. The central portion of the picture is a positive image of NGC3031; in the outer regions of the picture, an inverted image is shown. In this way, the faint structures of Arp's Loop are more readily discerned. Located about 12 million light-years from our planet, M81 (NGC3031) together with M82 (NGC3034), NGC3077 and NGC2976 forms one of the most iconic groups of interacting galaxies. The M81 group has also been the subject of many studies searching for and analyzing evidence of strong interactions among its constituents. 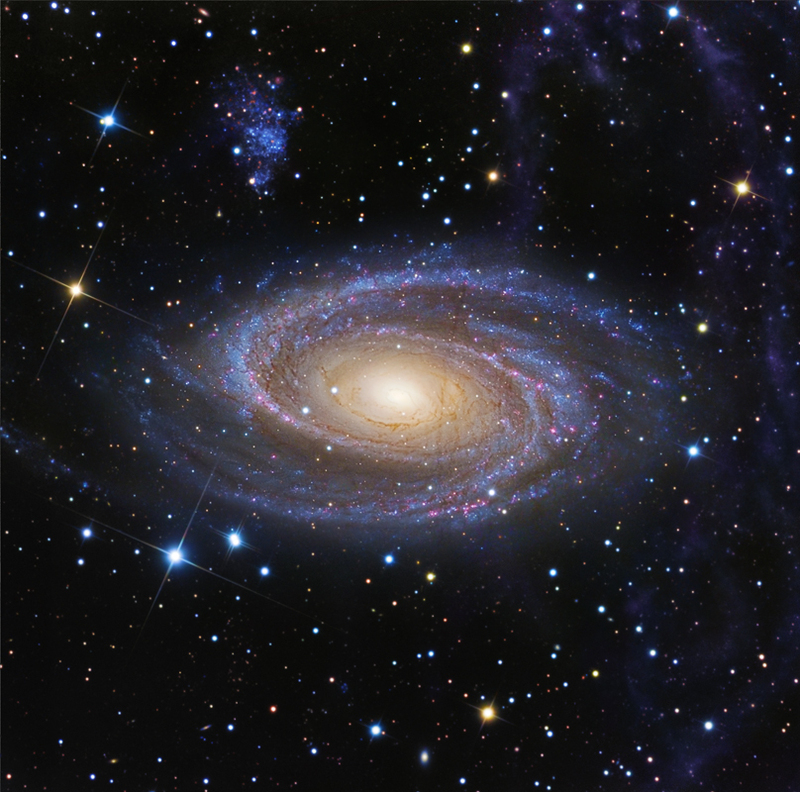 In 1965, Halton Arp detected an unusual looping feature near M81 (NGC3031) while examining photographic plates produced with the 48-inch Schmidt on Mount Palomar. Traditionally, Arp’s loop has been interpreted as a tail resulting from the tidal interaction between M81 (NGC3031) and M82 (NGC3034). However, since its discovery that explanation has been doubted by many researchers. Interestingly, the region of the sky containing the M81 group of galaxies is filled with Galactic cirrus and Arp’s loop exhibits colors and emission properties similar to those observed in Galactic cirrus clouds. Our purpose was to identify the sources of the loop's optical and infrared emissions then use that information to better understand the true nature of Arp's loop. The morphology of Arp’s loop was studied using very deep wide-field optical images obtained with modest instruments located in extremely dark sky locations. We also measured its colors using IRAS and Spitzer-MIPS infrared images then compared them with images of M81 (NGC3031) and galactic dust cirrus that fills the area of the sky where M81 (NGC3031) is located. Our optical images revealed this peculiar ring has a filamentary structure characterized by many dust features overlapping the field of view of M81 (NGC3031). The ratios of far-infrared flux and the estimated dust-to-gas ratios indicate the infrared emission of Arp’s loop is dominated by cold dust that is most likely from Galactic cirrus that lies above the Milky Way. Although our observations cannot exclude the presence of some material stripped from the disk of M81 (NGC3031) and/or M82 (NGC3034) that is chance located in our line of sight to and far behind this intruiging structure, our findings suggest that Arp's Loop is situated between the observer and M81 (NGC3031) and represents an optically (relatively) bright concentration of Milky Way galactic cirrus. Click here and download the complete PDF documentation.